LIKE an athlete preparing for a major marathon I have been getting ready for the plein air festival on the peninsula of Door County, Wisconsin. And like many athletes I discovered that the most important preparation is mental. After getting myself worked into a frenzy, worrying about all the incredible artists I would be painting with, some of whom undoubtably paint entirely en plein air, I decided I needed to go back to basics, simplify my process, and stop worrying about competition. Above all I realized that given the highly personal nature of art the only competition is with myself. Last Wednesday I picked up my painting Road to Eden (see entry 29 Advanced Underpainting 1 of 5) from the Springville Art Museum. As I looked to see if my painting had been included in the catalog I discovered that not only was it included but it had won a merit award as well. It was a well timed confidence booster. As I went painting last night and came home with a perfectly acceptable painting I noted the changes that occurred in my thinking. First I realized that excessive dependence on formula can cause creative paralysis. Sure, it is good to know certain principles, but there comes a time when these have to be lightly held and not hovering in the forefront of the mind. Second, I have to simplify my process, not make things more complicated in the field. Hone complex painting procedures in the studio, then simplify them, and practice them intuitively in the field. Fourth, there is no substitute for getting the color right. By right I mean achieving a complex and nearly indescribable relationship between value and hue that reflects the color you see but, most importantly, replicates the color relationships seen in the motif. In other words, it is the relationship of color rather than absolute accuracy (which is impossible anyway given the limited nature of paint versus the nearly unlimited nature of light). Mentally preparing myself was an interesting process, even though I thought I was preparing myself technically. Of course, it had a great deal to do with the fortuitous merit award for which I am grateful, but maybe next time I will understand that the greatest challenges in painting happen within the walls of our own mind. I will be giving a demonstration of my painting techniques at the Door County Plein Air Festival (July 19-24, 2010). The exact time is yet to be determined but if you are in the area be sure to drop by. For more info call 920-868-3455 or email info@doorcountypleinair.com. 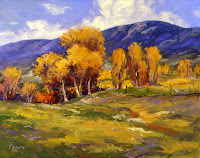 Your new post is timely ( and bolstering ) for me, as I'm being commissioned to do a plein air landscape. I haven't painted outside on site for many many years. Your blogs ( and videos ) really help me begin the "...mental preparation..." for the challenge, as well as the practical. One thing I need to do is make a red acetate viewer, which you suggest in one of your videos, I can't recall which video or what color you used on your cd plastic case version. It's crucial to simplify the field equipment. What supplies and colors do you consider indispensable. A limited palette is advisable I'm sure. Do you carry only spectrum colors? Congratulations on your merit award, a little recognition goes a long way. Very natural. I like this sort of Arts. Its very good to watch. Yes, that interlocking quality is something that naturally happens when I try to get a nice rhythm going through the painting. I didn't use much terre verte in this painting. I use that color primarily for its ability to disappear as I lay other colors over the top. I have been experimenting with applying a fairly solid warm color beneath all green areas. I paint this solid area as if it were a silhouette, not worrying about internal detail. I might shift the color from purple at the warm base of a tree to a bluer purple at the top. I then paint my greens into this mostly flat field of color. It has a naturally neutralizing effect yet the oppositional color can show through and give a lot of vibration. I might use a Cad Red beneath a patch of grass with purple where the tan strips might be. It is best if these silhouette "puzzle pieces" are the same value or a bit darker than the final color. Thalo Green and Dioxizine Purple for shadow. Add a bit of Ultramarine Blue in the cooler sections. For the warm areas of trees or grass use a bit of Thalo Green with Cad Red. Mix in some Cad Yellow Deep to add warmth to the sunny patches. You probably will need to add more of the red hue to the green than you think because greens need to be neutral. The acidic green you get is from getting too much saturation. Use the color underneath to create a field effect, that is, to optically project green into that field of color. This makes for the oft mentioned vibration, but more importantly, it creates a truer impression of the complexity of green. Steve and Timmy, many thanks for your positive feedback! It keeps me going. Your tips of painting green are excellent and I will be taking heed of them soon, as I begin a fairly large landscape with lots of tree-covered mountains in it. I've got to figure out a way to make all those green areas pulsate with life without becoming gaggy green. Your silhouettes of under color make much sense. In your new painting, I love how you achieved a rich central area of color by surrounding it with darker valued greens. Those dark greens ( particularly in the right foreground corner ) have deep low color without becoming dead shadow. Very beautiful work. I'm curious about how dry the "...solid warm colors beneath the green..." are before you paint over them. Or perhaps you paint into them, wet-into-wet. I will be using a new medium from Natural Pigments called Epoxide Oil, which I believe will dry fairly quickly so that I can over-paint areas in one day's work, especially if I add a little solvent to it. What medium did you use for the above painting? When I do a red or pink underpainting for greens it is almost always extremely wet. Allowing the red to dry would make it so that only the flecks of canvas that aren't covered will reveal the red. I want the red paint to actually commingle with the green to give rich, broken color. You can experiment with pushing on the brush at different angles to allow different amounts of red to mingle and mix. I didn't use any medium in the above painting as it was painted entirely alla prima. Let me know about the Epoxide. Natural Pigments makes some really cool products.